APEX gaming – VIP Pinnacle Premium introduced at ICE – APEX pro gaming a.s.
APEX gaming has extended its gaming offer with the introduction of its VIP gaming machine called Pinnacle Premium. Two brand new models were introduced at the ICE – the extra-large upper monitor either with a flat screen or a curved screen. Both portray the APEX games in pin-sharp high-definition graphics. The games selection has grown even more with the new EVO 3 games platform containing games that come to life so much more on the large wide-screen of the Pinnacle Premium. These games include the new Book of the 7 Seas, Eye of the Dragon and new Fruit Games. Each game contains exciting features that make great use of 3D technology. Alongside such exciting advancements, the APEX gaming team has added a traditional game to its repertoire, namely Bingo – where the player can bet on a number of balls – and this choice positively affects the potential win. The Pinnacle Premium completes the Pinnacle slot machine family of APEX gaming. There were further innovations of the well-known Pinnacle SL 27 and Pinnacle NSL 27 Pinnacle slant-tops alongside the upright Pinnacle 24. Naturally the EVO games platform are available for all Pinnacle gaming machines. APEX gaming now offers a gold edition with a gold-plated front around the gaming monitors – thus right where the player focuses their eyes. This gives the player a further feeling of playing on a premium slot machine. Another innovation includes the possibility for operators to include their own company name on the Pinnacle – and so brand them accordingly. The LED lighting around the Pinnacle attracts player attention as well of course. 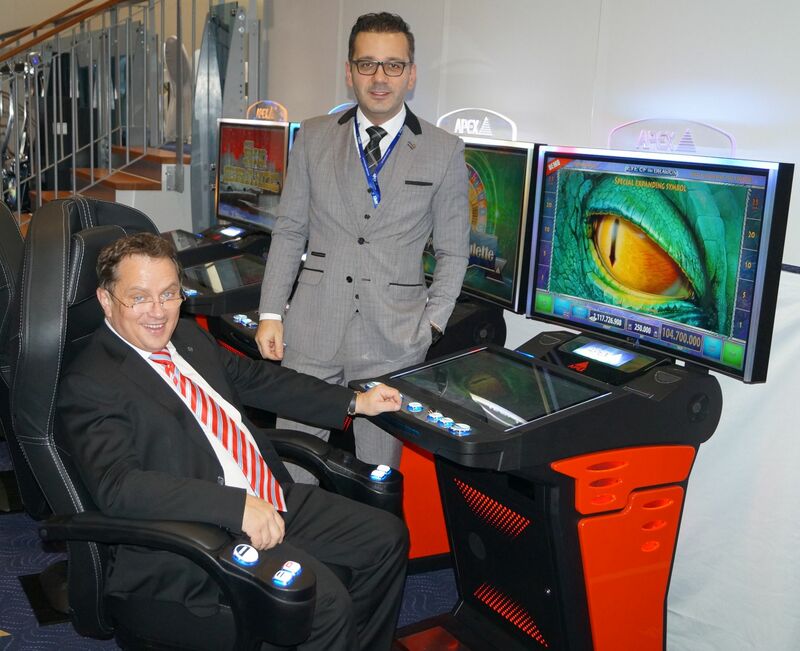 The automated electronic roulette solution from APEX gaming – the APEX PLAYER STATION (APS) is the terminal-based roulette solution. Thus, operators can choose the number of roulette wheels and terminals to fit their needs. New to the ICE this year is the APS as a complete unit – presented with the corresponding infill panels between the terminals and a high-resolution 4k display that can show the roulette statistics of up to four separate wheels. The APS has a modern, refreshing design and offers four games as standard – Roulette, Sic-Bo, Baccarat and the APEX-only game Quikker (where players bet on a combination of cards). Furthermore, the APEX slots games can be enjoyed on the APS. The APS can be linked to a maximum of four roulette wheels – including live roulette wheels. Thus, the player can choose the roulette wheel he or she wishes to play upon. Another highlight that APEX gaming offers is that the APS, slots games and APEX MOBILE SLOTS can be linked together to create maximum gaming entertainment. The possibility to incorporate mobile gaming right within the casino is made reality thanks to APEX MOBIILE SLOTS. Players can play on a tablet, for example in the casino bar or restaurant. On a busy evening when the APS is full, players can join in the action via the tablet. 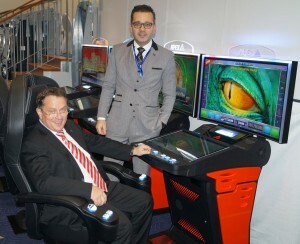 Here again APEX gaming offers the technology to stream the live roulette wheel onto the table as well. Money can simply be transferred to the tablet or paid back from the tablet to the player when using the iDROPe. The iDROP and iDROPe are the revolutionary cash-handling devices for live gaming – enabling croupiers to accept cash, tickets or card in exchange for jetons. Players no longer need to go to the cash desk to exchange their cash for jetons. Similarly, players can cash out their jetons at any time to receive the value printed as a ticket or placed on their card. The iDROP is the solution to place within the table, the iDROPe is the side-mounted solution with larger dimensions as it contains a note stacker with a capacity of up to 2,000 notes – so simplifying the drop even more. It goes without saying that operators have a complete overview of the contents of the iDROP/iDROPe. The danger of shrinkage is completely removed. Indeed, fitting the iDROP/iDROPe to live gaming tables enable operators to renounce upon the need for a cash desk. The integrated touchscreen makes it simple for operators to run. The iDROP connects with the SAS communication and can run with any casino management system (CMS) – so providing clear and reliable instant reports on the drop. “At APEX it is all about taking gaming to the next level. Each solution we offer is a premium solution. We invest in creating the best. That is why the Pinnacle Premium fits so well to our product range. The feedback was excellent as was for all the solutions we offer. We are bringing real value to our industry as the iDROP demonstrates – our in-depth knowledge of operations and manufacturing puts us at an advantage that we share with our customers”, explained Kubilay Özer, Global Sales Director at APEX gaming.